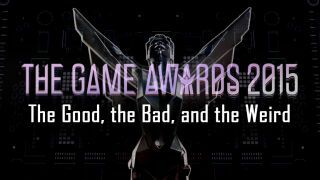 This year's Game Awards may have been about all about the trophies, but all the little reveals and surprises were what really stood out. Now with more dinosaur cops and minigun-toting Vikings! If by some chance you missed out on Kung Fury and its brand of over-the-top 80's style and action, first stop what you're doing and fix that. ...Done? Great. Now that that's been taken care of, the equally retro and absurd video game tie-in the film, Kung Fury: Street Rage, is getting an loaded with challenging bosses, new playable characters voiced by the film's cast, and immediate availability on Steam and PlayStation 4. Dim Bulb Games, founded by an original member of the team behind 2013's dark horse hit Gone Home, released a teaser for the enigmatic Where The Water Tastes Like Wine. The amount of intrigue crammed in the minute-long teaser was enough to garner our attention. While details for the game itself are mighty slim pickings, the gorgeous painted artwork paired with the Americana-inspired setting leaves us wanting more news to arrive as soon as possible. Goat Simulator has always walked a fine line between "legitimate product" and "full-on parody" since its launch last year. Keeping up the game's sense of humor, this year's Game Awards pre-show teased new content for Goat Simulator known as the "Super Secret DLC." What exactly comprises the new content is, well, super secret, but the tease of new locations and species to play with, including a flamingo and dolphin, has us hooked. Rise of the Tomb Raider, released barely a month ago, is already preparing to carry on the next chapter of Lara Croft's storied and ever-demanding adventuring career. The new downloadable chapter, titled Baba Yaga: Temple of the Witch, features a whole new story, along with otherworldly enemies and other hazards that promise to add hours of new gameplay for fans craving more tomb-raiding goodness. Tron Run/r, quietly announced amidst the evening's festivities, shows off the virtual world of Tron re-imagined as an infinite runner akin to Temple Run or Spider-Man Unlimited. The striking aesthetic of glowing circuits and neon discs evoke an image that only Tron can, this time laden with obstacles to jump, slide, and glide past for a high score. Tron Run/r is available now on Steam as an Early Access title, and while the game is a work in progress, the promise of light cycles in a future update is exactly the kind of thing that'll bring Tron fans back to The Grid. TBS is launcing its own eSports league? Wanna talk about an announcement from out of left field? How about Turner Broadcasting teaming up with WME | IMG to found a new professional eSports league? Starting next summer, TBS's new Eleague will be airing over 30 hours of competitive gaming each week. One of its first major events will be a Counter-Strike: Global Offensive tournament with a reported prize pool of $1.2 million, (approx. £793,000/AU$1.6 million). Will eSports finally find its place among the likes of Major League Baseball or the NFL? Only time will tell. As Game of Thrones and Tales from the Borderlands reach the tail ends of their respective seasons, Telltale Games was itching for the next franchise to adapt with its unique brand of adventure game storytelling. Who better to be up to bat next than, well, The Bat? Gotham's Dark Knight will have his own series starting in 2016, but Batman's not the only comic book protagonist Telltale is working on. Enter The Walking Dead: Michonne. Announced earlier this year, the blade-wielding heroine of the zombie apocalypse will begin her own three-part miniseries this coming February. Don't hold your breath for The Walking Dead: Carl edition anytime soon, though.